Thanks for the report, could you please attach your /var/log/messages after reproduced the issue? thanks in advance. I am suffering from the same problem but on my Samsung Galaxy S, used to work in Natty. It's pretty quiet, this is after two unsuccessful attempts to send a file to my phone (18:37). Same thing. Also I cannot pair Phone->PC if the pairing is initiated from the phone. The phone asks if the pin is correct, I confirm, it then says pin incorrect. Samsung galaxy, Android. Same problem with my Samsung i5800. Same problem with samsung galaxy s2 - also it seems as though bluetooth audio will be broken. I have problemas with bluetooth in Ubuntu 11.10 too. I can send files but when it ends my system brakes and I need to restart that. I'm using the default manager of Gnome 3. Seems I checked “Share public files over Bluetooth" in Personal File Sharing Preference panel, then I could send files in ~/Public folder to my smart phone. Files not in ~/Public folder can also be sent over Bluetooth. The same problem between my lg510 and ideapad z460. Same problem, Lenovo X201-Samsung S5230. Please has someone assigned to look at this bug as it's really makes me feel handicapped when this bluetooth stops working. I can confirm the bug as well as as the error message Permission denied (13) when I initialize sending a file. Sending files from ~/Public folder  to my Android phone doesn't work for me. 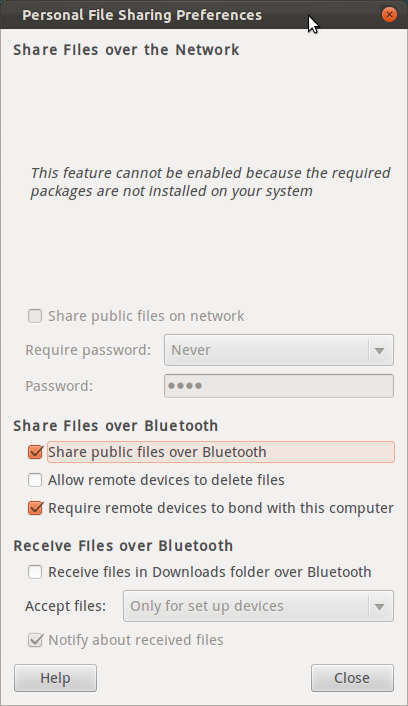 I have configured sharing over bluetooth in gnome-file-share-properties and paired the devices successfully. But I still get the permission denied (13) error. Sending files the other way around works like a charm. I'm not so sure it's the kernel. I could receive files on Fedora 15 (3.0 kernel) just fine. On F16 it fails to send, receive, or browse. Pairing works fine, but repairing doesn't fix anything. It fails with SELinux enabled or in permissive mode. I see this in my /var/log/messages after trying to send a file. Installing bluez-hid2hci does allow browsing to work, but file transfers (to or from) do not work. > I see this in my /var/log/messages after trying to send a file. > pid=976 comm="/usr/sbin/bluetoothd -n ") interface="(unset)" member="(unset)"
In my case I could not send files from F15 either when I had installed all updates. My hcidump output (sorry, I do not have it right now) said that the rejection (which you have mentioned) was due to an authentication failure. Other error messages elsewhere also hint at being unable to find the OBEX transfer service on the phone. Please do not consider the issue of being unable to receive files via Bluetooth to be part of this bug. It is because Fedora 16, for example, does not have the gnome-user-share (Personal File Sharing) package installed in GNOME by default. However, gnome-user-share now depends on httpd on Fedora so it becomes imperative to install httpd (Apache Web server) even if we do not need the network sharing facility. gnome-user-share can work just fine without httpd. Setting up BlueDevil to receive files on KDE works correctly, and gnome-user-share does not depend on httpd on Ubuntu now and is also installed by default there so setting it up to receive files also works. This should be filed as a separate bug. The main problem here is that sending files (OBEX push) does not work. Browsing, including copying to and from, through obexfs (package) works but may require several tries to connect. In particular, it only seems to work for paired devices and the computer may need to be restarted after pairing, so the whole set-up is rather more of a headache than a workable solution, although right now it is the only workaround I know of. My F15 boxes (now all F16) had gnome-user-share installed and all could transfer Bluetooth files just fine. There is a dependency problem if bluez-hid2hci is required. gnome-user-share should Requires it. After attempting file browsing again today, I was able to transmit to/from and delete files on my mobile phone through the browsing window. I was also able to transmit to my phone using nautilus Send To and receive files from the phone. I'm not sure why the first attempts failed, but now everything seems to be working. IMO this looks like a dep issue and should be assigned to gnome-user-share. I've exactly the same problem. If I start F15 with 2.6.38-8, bluetooth filetransfer works without problems. But if I use a Kernel > 2.6.38-8, it doesn't work. Maybe not all bluetooth adapters are affected. > bluez-hid2hci is required. gnome-user-share should Requires it. > transmit to my phone using nautilus Send To and receive files from the phone. > IMO this looks like a dep issue and should be assigned to gnome-user-share. Do you mean that installing gnome-user-share allowed you to send files from F16 to a remote device? > to a remote device? No. My F15 machines were upgraded to F16 using preupgrade. Those machines already had gnome-user-share installed prior to F16 and they continued to have it installed while on F16. I was only able to send files once I installed bluez-hid2hci. I've discovered where the problem comes from: some devices are unable to respond to open request in rapid succession after the SDP scanning. You need to close SDP session and wait 2 seconds before connecting to rfcomm, like the attached patch. The attachment "sdp.diff" of this bug report has been identified as being a patch. The ubuntu-reviewers team has been subscribed to the bug report so that they can review the patch. In the event that this is in fact not a patch you can resolve this situation by removing the tag 'patch' from the bug report and editing the attachment so that it is not flagged as a patch. Additionally, if you are member of the ubuntu-sponsors please also unsubscribe the team from this bug report. The same problem between my samsung phone and fujitsu MH-330, service list just dial-up,no file transfer no object push. I've installed blueman (bluetooth-manager) package. I just found that my netbook CAN receive files SUCCESSFULLY from my phone while the bluetooth-manager (blueman) active,but CANNOT send back from my netbook to my phone. [Sending files - failed with the a 'permission denied error(13)']. Are we talking about the same bug? > Are we talking about the same bug? attached is the patch for obexd. I confim. Samsung Galaxy 5 in Ubuntu 11.10 (gnome-shell). IMHO this bug is critical. Bluetooth is the stardard way to comm with mobile. All Ubuntu look&fell is affected by this bug. How will change to Ubuntu if it cannot comm with his mobile? > it cannot comm with his mobile? would be nice if my or similar workaround would be accepted though. The bug stills present on the alpha version of Ubuntu 12.04, hope to see to solve soon. Connection to the headset I use to listen to music (LG HDS 700) also fails with the bluetooth applet, but works with blueman, as mentioned earlier in this bug. It worked with the applet exactly one time, then not again. Comment #14 suggested to look into the "Personal file sharing" settings but I cannot find them in Unity's system settings (though the package gnome-user-share is installed). I might help with this bug. I tested it on a Natty machine too and it worked perfectly. Indeed not an issue with gnome-bluetooth really, this has more to do with obexd or obex-data-server than GNOME (and probably not bluez either). I'm reassigning this to obexd for now, since there really does seem to be something wrong with it at least in precise (and updating to the latest source seems to let it work better). The two patches provided might help, but I'm just generally not fond of adding timeouts for the fun of it; it always seems like there ought to be a better way to achieve this. However, since the "ugliest" one is for obexd, which has heavily changed in 0.43, it still seems like the lesser evil than trying to look through and backport the changes. The issue probably also affects o-d-s, so let's keep a task open for it too. The file sending process randomly succeeds after several tries, sometimes, especially if the devices are paired. But mostly, it fails. Also, this problem does not occur, at least in my case, when sending to a Nokia smartphone, but for all other devices, it fails. @Alec: Bug 733847 is indeed a duplicate of this one, but using a laptop with an in-built Bluetooth adaptor, I am unwilling to use an external dongle instead. The problem did not occur in previous kernels (or Bluetooth stack versions), which clearly indicates that this is a regression. I can get my N900 mount following your method. I can see files, but copying doesn't move even a bit of data, and end up crashing file manager. The command is hciconfig instead of hcidump. Does anyone know how to make the workaround persist across Bluetooth on/off and system reboots? Thanks Saurav. Changing the command as you suggested mounts my N900 properly. With obexfs solution, I wasn't able to transfer files from/to the device, now I can transfer successfully. I'm confused, so does bluetooth file transfer work in Fedora 16 or not? Ok, I see now, what confused me what that for some of you mounting and downloading images FROM bluetooth devices also fails. Downloading files FROM mobile devices works perfectly in Fedora 16, as you can see in my attached screenshots. Sending files TO mobile devices via bluetooth fails for me also even with latest kernel and all updates. Any news when is this issue scheduled to be fixed? Who needs to fix and what? Is it this responsibility of GNOME Bluetooth devs to make new versions of bluetooth tools that work with new kernel? @Valent: This is not a problem in GNOME. The workaround mentioned in comments 18 and 19 works, but I have been unable to find a way to make the workaround persist across reboots. The Ubuntu developers seem to have fixed this: https://bugs.launchpad.net/gnome-bluetooth/+bug/872044. Has this been fixed in any kernel or BlueZ update for Fedora 16? If not, can we get an update here as well? Ubuntu have fixed this (both file and internet) 12.04 and they appear to use the same method and tools as fedora. When will this be fixed? what do you mean by 'internet does not'? Are you talking about bluetooth tethering? that's nothing to do with this bug, I don't think. tethering is a completely different path from file transfer. > downloading images FROM bluetooth devices also fails. > see in my attached screenshots. > latest kernel and all updates. > Any news when is this issue scheduled to be fixed? Who needs to fix and what? > bluetooth tools that work with new kernel? Sorry, but not for me with a Samsung Galaxy Gio GT-S5660. After all new updates everything looks fine in Gnome and KDE, all drivers are loaded, devices seen, reaction seen in bluetooth-windows and icons, but no filetransfer or connection is happend. I´m using a Acer Aspire 7750G and with the VMware original aspire-clone VM bluetoth is working perfect but not with original fedora 16. I used to be able to send files from my Dell laptop running Fedora16+KDE to my mobile phone by simply selecting "Send via Bluetooth" from the 3rd mouse button popup menu with the mouse on the file to send in Dolphin but then the other day that stopped working. for "fix segfault while sending (#766314)"
and with that the file transfer again works. and send file from KDE using bluetooth still does not work. Logging in as root to KDE makes no difference. and if accepted then the file name briefly shows in the bluetooth directory on the phone. If the file is large then the confirmation prompt does not show. irrespective of small or large file. Is bluetooth completely messed up? Will this be fixed anytime soon? What is going on in kernel team that maintains this code? Are you still have this problem in updated Fedora 16? And please, could you try reproduce this bug in Fedora 18 Beta RC1? Moving this bug to Rawhide version as this bug occurs in F16 to F18 releases and it's very likely to hit also F19. Obex push has been fixed in F18, but not in F17. It seems to be same bug as #747575. Displaying first 40 and last 40 comments. View all 158 comments or add a comment.